Pronounced “pins-gouw-er”. Around the year 500 A.D., Alpine herdsmen who ran their cattle on small, widely scattered, rocky pastures had begun to develop a breed of red and white cattle from the native red Bavarian cattle. These early cattlemen selected animals that could withstand the harsh conditions of the Alpine mountains and still produce meat and milk. The name Pinzgauer derives from the district of Pinzgau in Austria near the Italian boarder and appears for the first time in documents of the 1600's. Herd books dated in the 1700's show that selective breeding had been going on for some time. 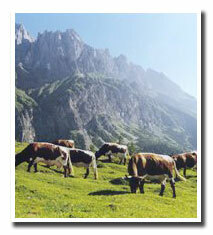 There are records of exportation of Pinzgauer cattle to Romania, Czechoslovakia and Yugoslavia in the 1820's. In the early 1900's a large number of breeding cattle were exported to South Africa, which has the second largest herd of fullblood animals in the world. Pinzgauer cattle were first i mported into Canada in 1972 and to the U. S. in 1974. The Pinzgauer is very adaptable to a variety of climates. Because of this adaptability, Pinzgauers thrive in the cold, snowy regions of the U.S. and Canada, and also do well in the desert of Texas and the humid regions of Florida. The Pinzgauer breed shows distinctive markings with a dark red coat with a white top line that is narrow at the shoulders and becomes wider towards the rump. The tail and underline are also white. Rigid color selection many years ago insures that this pattern remains true in Pinzgauer offspring, even in those cases where a Pinzgauer bull is mated to cattle of another breed. Eye problems are rare. Smooth hair and firm, but flexible skin prevents tick and other insect infestations. The pigmentation of the skin and hooves protects this breed from the sun. Mature bulls average 2,000 pounds and up, while mature cows level out around 1200 to 1600 pounds. The breed reaches sexual maturity at a very young age, and retains above average fertility. Another key trait is the native docility of the breed. Although small in total number of head in the U.S. Pinzgauers have been included in studies performed at the U.S.D.A. Meat Animal Research Center, Clay Nebraska for many years. These studies have shown that Pinzgauers produce meat that is among the most tender of any beef breed and routinely exceeds other breeds in juiciness and flavor. Because of the enzyme makeup of these animals, the meat retains its tenderness without the use of artificial chemical processes. Additionally, Pinzgauer steers in the feedlot show above average gains and a minimum of health problems. The reason different breeds of cattle are crossed is to produce crossbred progeny, new gene combinations are formed which are generally not seen in either of the parent breeds. Additive genetic effects still help define the animal genetically, but these new gene combinations cause most crossbred progeny to exceed their parents performance. This is known as hybrid vigor or heterosis. Additionally there is another reason to produce crossbred animals. It is called breed complementarities and it increases productions levels. The strong points of one breed will mask the weak points of another and produce a better animal. 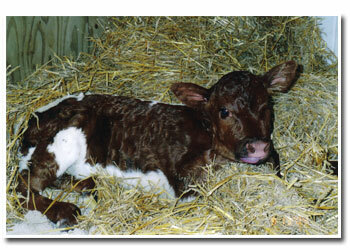 MILK - If you are raising replacement heifers, the milk and maternal traits of Pinzgauer are as good as there is. In Austria, where the breed was developed almost 1500 years ago, they are considered a dual purpose breed, dairy and beef. You can expect these replacements to have improved milking qualities meaning improved weaning weights of their calves. SIZE - Pinzgauers are a moderate frame breed and will compliment almost all other breeds size wise. Birth weights are comparable with other continental breeds of 80 to 85 lbs. Weaning weights are on average slightly larger primarily due to their improved milk production. CARCASS - This is an area where Pinzgauers excel. USDA Meat Animal Research Center, Trait Averages for Steers of Pinzgauer breeding have over 61% Choice; over 69% Retail Product; Rib Eye Area of 11.28 sq in. The Journal of Animal Science Breed Effects, Retained Heterosis, and Estimates of Genetic and Phenotypic Parameters for Carcass and Meat Traits reports Pinzgauer had the highest score, 5.16 for fat marbling among European Continental breeds, only Angus and Herford scored better and that was less than .35. Shear force (tenderness test) for Pinzgauer was the best 4.47kg verses 4.5 for Angus to 5.78 for Gelbvieh, with most breeds being over 5.0kg. Research is continuing but the handwriting is on the wall - Beef Quality Genetics are in the future of all quality beef cattle operations. COLOR - Now for some good news and some bad news. Due to over a thousand years of rigid color selection Pinzgauer offspring will retain their color pattern, white top line, white tail, and white underline. We cannot make them black. The Beef Improvement Federation (BIF) outgoing president reported that among many things a pen of cattle will look like in the next 5-10 years was "Color won't matter."